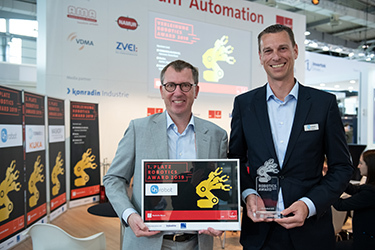 In the run-up to the 2019 Robotics Award, numerous enterprises and institutions from Germany and abroad submitted innovative solutions in the fields of industrial automation, mobile robots and/or autonomous systems. Three made it through to the final round at Hannover Messe. The second prize was awarded to a joint project by forwardttc GmbH and KUKA AG. This project involves a low-cost charging assistant for electric vehicles (both private and commercial). The automatic charging process is initiated via a remote control or an app. In terms of the possible charging capacities, the charger is compatible with all electronic passenger vehicles, and the process can even be adapted for other innovative fuels such as hydrogen. Third prize was awarded to Maskor, the Institute for Mobile Autonomous Systems and Cognitive Robotics at the Aachen University of Applied Sciences, for its autonomous field robot (“ETAROB”). The function of this robot is to facilitate cost-effective weed management in vegetable production. In contrast to conventional systems the ETAROB can navigate freely in an unstructured environment, avoid obstacles and remove weeds by their roots.